You can now change the E-mount of your camera with a “wiggling-free” full metal mount! The lens mount is a two part construction, with the critical component that holds the lens in place made of plastic. This is why any lens you attach to an E mount camera is prone to wiggling, especially longer pro lenses. Anyone can replace the original 2 piece NEX mount on their camera with an all-metal one in about five minutes. All you need is a jewelers screwdriver (phillips) to remove and replace four little screws. The Fotodiox full metal E-mount ring can be bought now at Amazon US (Click here). 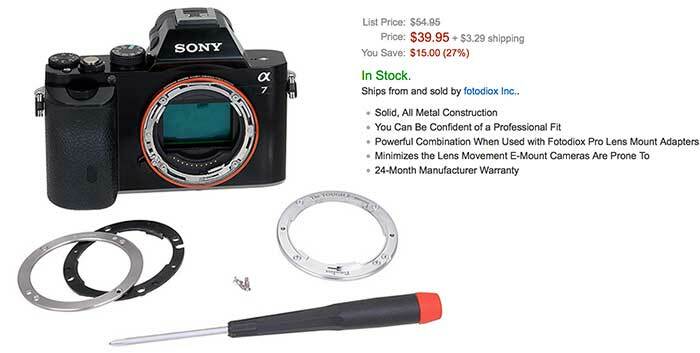 previous post: Sony A7 and A7r deal reloaded: $200 off and free bag, free card, and 5,000 reward points at SonyStore.